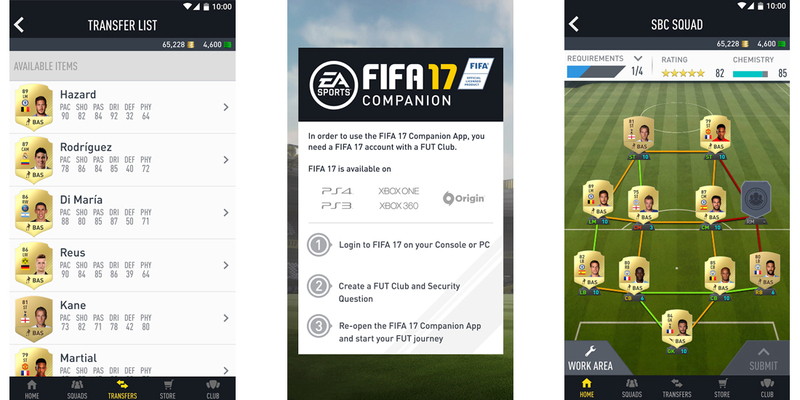 FIFA 17 Companion is available for all the new mobile application platforms, a must for all those users who, like every year, spent hours in the company of the new episode of Electronic Arts, available in its final version from September 29 for all major platforms: iOS, Android and Windows Phone. FIFA 17 is free and available in all app stores of each operating system. However, there are specific and mandatory conditions for using the app, such as possession of an EA account and the same title on the PlayStation 4, PlayStation 3, Xbox One, Xbox 360 or PC, and finally also the FIFA Ultimate Team club. By achieving these conditions, the user can take advantage of the new gaming experience, even from smartphone or tablet, both live and recorded, quite a change compared to the "classic" versions for console or computer. Despite all these conditions, the FIFA 17 Companion has no links with the computer game or console, but it is to get a team for the next challenge, check the useful moves to the next game, maybe you find that player you can make a difference in the coming challenges. Everything from a phone, either traveling or sitting in a bar with your friends. In short, a new way to delve into the management of a football team, preparing and training players, as well as control the market and carry out transfers needed to improve. This and much more, as described in the official list of changes shown in the following link. The three versions of the game have multilanguage support, including Spanish, English, German, Italian and more.